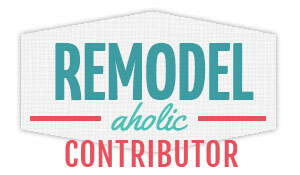 Oh boy, am I excited to share my Easy Wood Storage Shelves with you today!! This is not "pinterest" pretty, but it sure is beautiful to me! See!?! Wood stored up off the floor is an awesome sight, especially in my workshop! Yay!!! This has been needed for a LONG time! 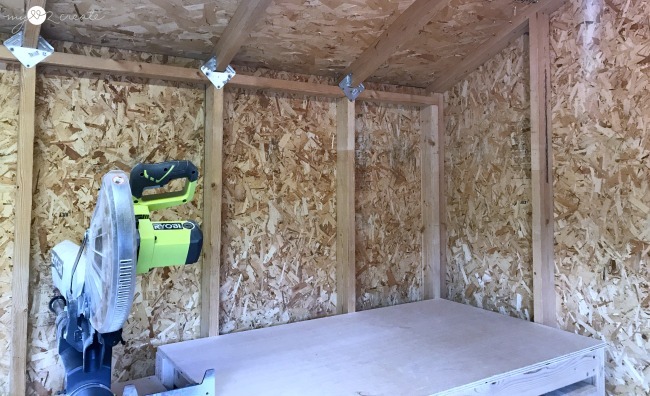 Now honestly, I have a whole bunch of posts I need to write on this shed/workshop of mine, and it's transformation. But I just couldn't resist sharing this latest project! I hope to share the whole process with you in some future posts...it has come a long way. For today let's just enjoy my new wood storage, here is a before. 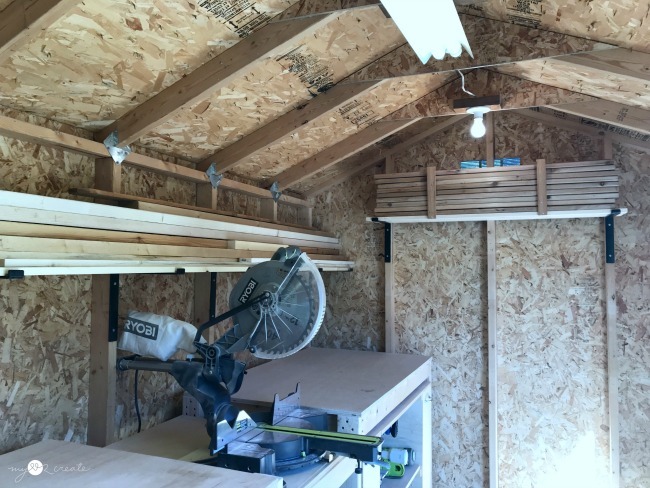 I have a tiny shop which is basically a shed in my back yard, and I don't have a lot of room. 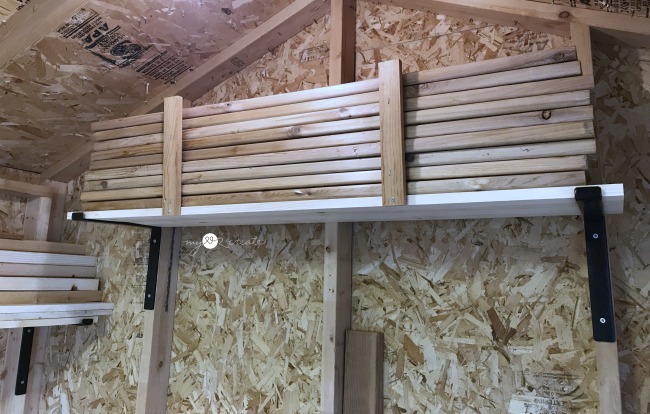 I had gotten some pretty amazing shelf brackets from Crates and Pallet for my downstairs bathroom/laundry room that I had hoped to re-do the end of last summer, but life has been way to crazy and they have been patiently waiting to get to work. 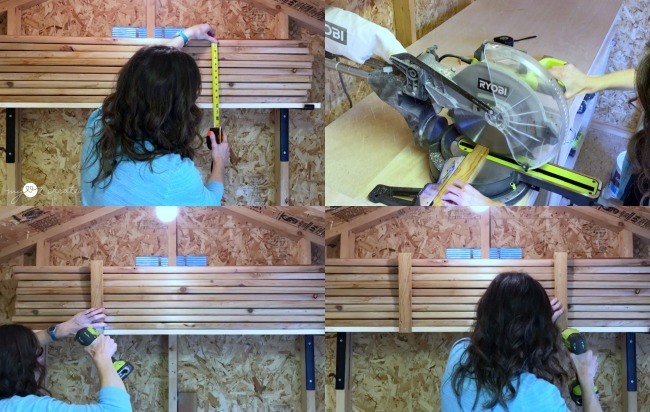 Then I had this idea, why not use them for easy wood storage shelves in my workshop?! I have a ton of waisted space...and so I got to work. Here is the other side. The best part about this whole thing? I didn't have to use a stud finder! Ha ha! 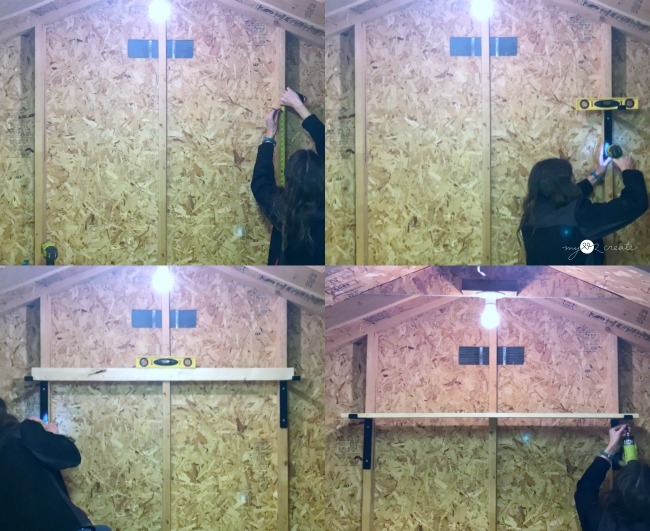 Step 1: Measure and mark for shelf placement. 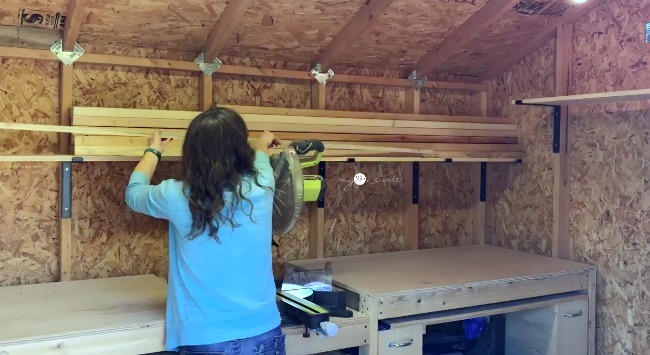 I wanted my shelves over my miter saw to be able to hold 8 to 10 foot boards. 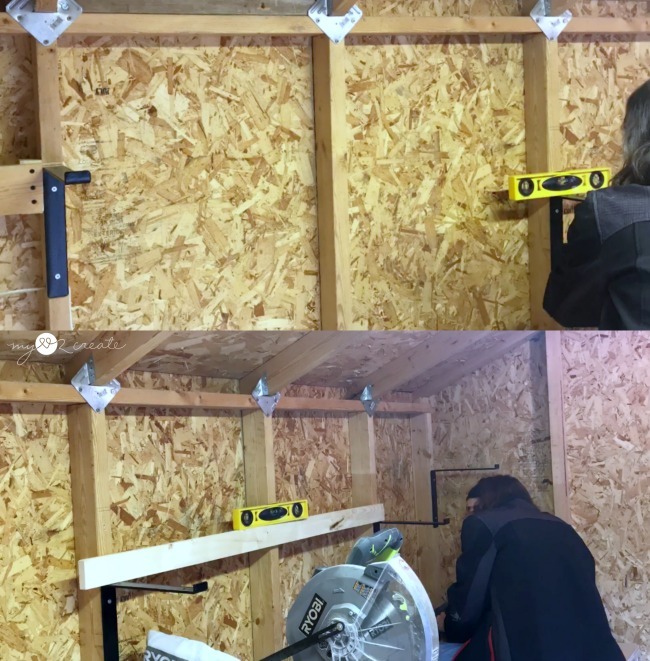 I measured how far apart the studs were to ensure proper placement of the shelf brackets to hold the larger sized boards. You will need to determine the size of shelves you want for your space. 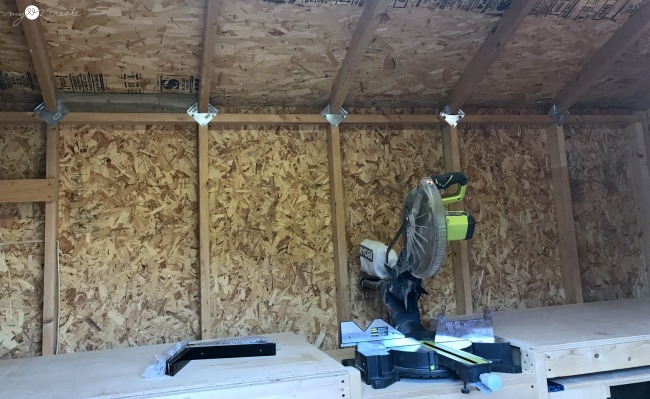 Before moving forward, on the left side of my shed I had a shelf support board that I needed to remove so that I could use the stud for attaching the shelf bracket. In the photo above I used a scrap 2x2 board and placed it behind the 1x4 support board and secured it to the stud with 2-3'' screws through the stud (top left) Then I attached the 1x4 support to the scrap 2x2 with 3-2'' screws (top right) and I also took out the screws that were attaching the 1x4 to the stud. Then I used my Ryobi Multi Tool to take off the part of the 1x4 that was covering the stud (bottom left). And now my stud was ready to be used (bottom right) and my shelf is still supported! Phew! Step 2: Attach Shelf Brackets in desired location making sure they are level. I started attaching my shelf bracket to the studs and then realized, once I had them all up of course, that I wanted them lower. I simply unscrewed them and used the lower screw hole from my first installment, for the upper screw on the shelf bracket. This enabled me to lower them with out measuring and marking. 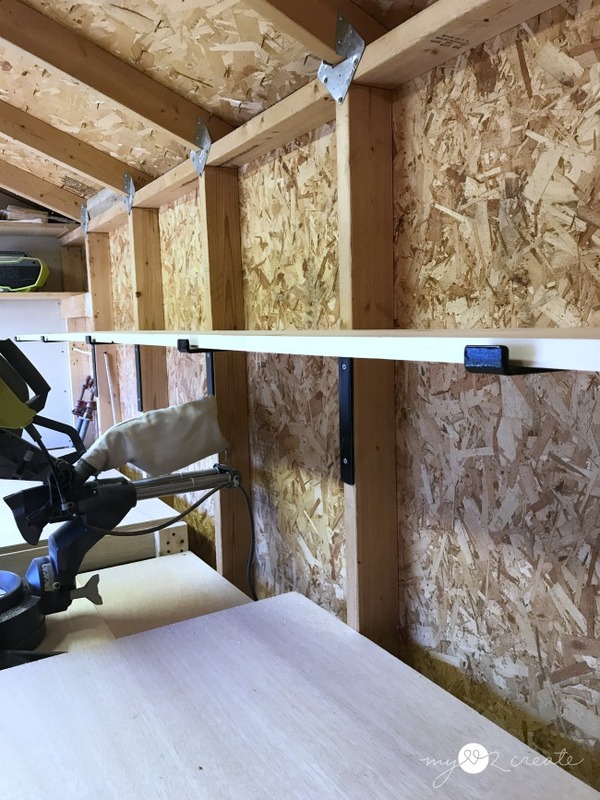 When you install the brackets pick the height you want and mark for your first shelf bracket and attach it with your 3'' screws. If you don't use self tapping screws you will need to pre-drill your holes. 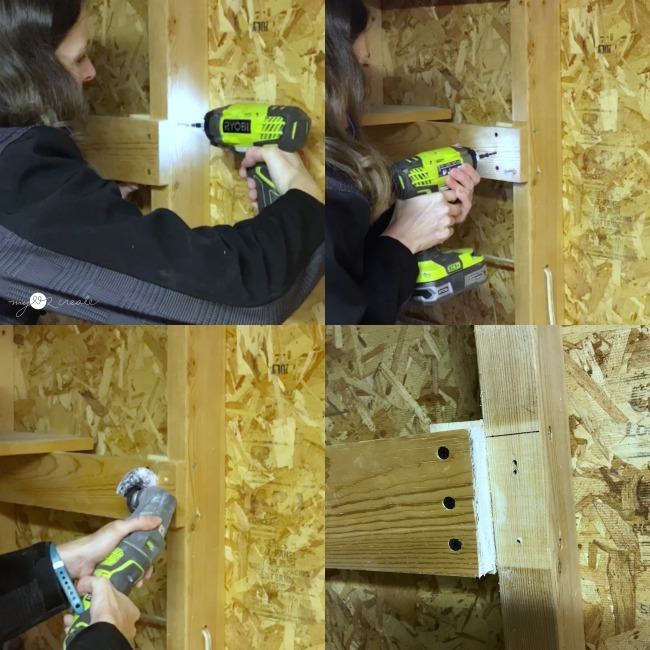 If this is the case, put your bracket up to the stud or wall and use a pencil to mark where to pre-drill, then remove your bracket pre-drill at the marks, then attach your bracket with the screws. You can see in the photos above that I used a board and a level as I was attaching my brackets. 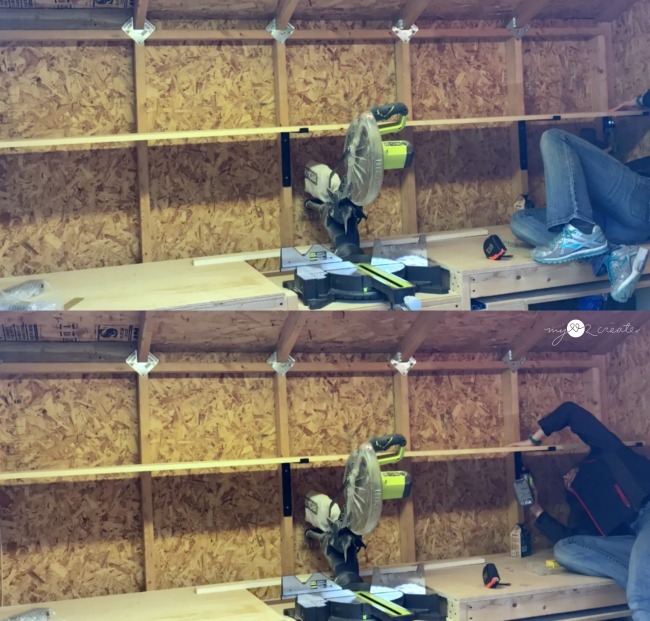 This way you can make sure you have nice level shelves! Step 3: Cut and attach shelf boards to the shelf brackets. 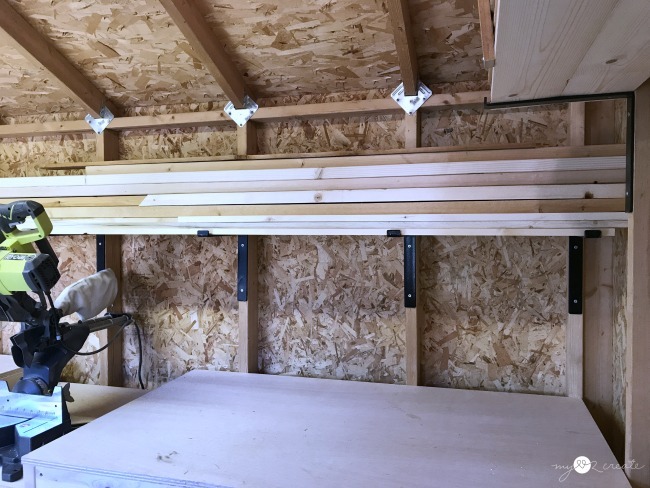 I ended up buying 2- 1'' x 6'' x 10' boards to make my shelves. It was cheaper than me buying one 1x12x10 board. 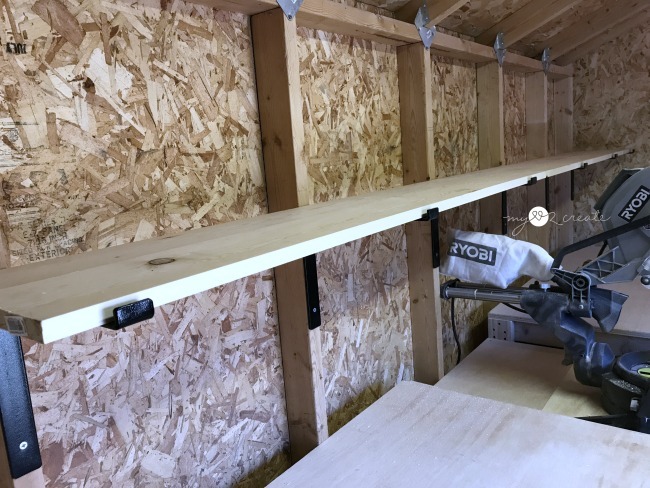 Once I cut the boards to the correct size to fit my brackets I used my 3/4'' screws to attach them underneath through the shelf brackets. 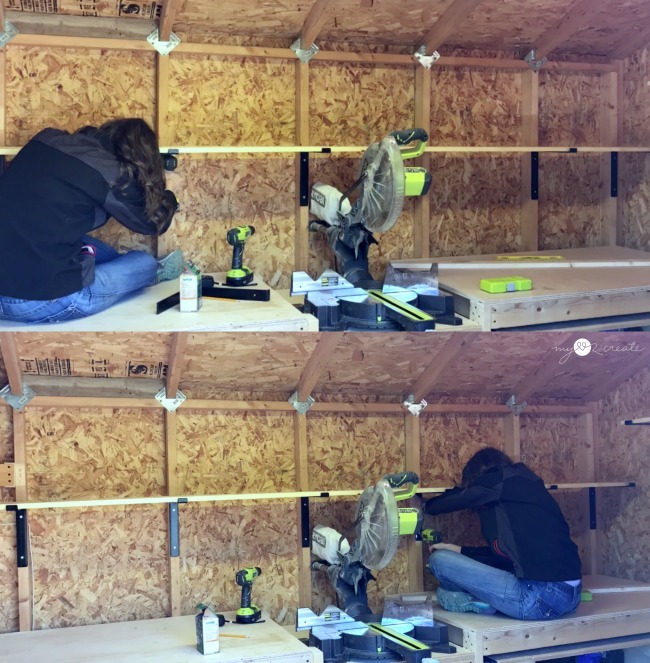 I also installed shelf brackets on my right wall of my shed, and here you can see the whole process in the photos above! They were super easy and fast to install! At the last minute I decided to put brackets on the two empty studs for the shelves over my miter saw. I actually don't think it was necessary, because they were sturdy already, but I know I am planning on storing a lot of heavy wood on them so I wanted to be better save than sorry! Here they are ready to be used! 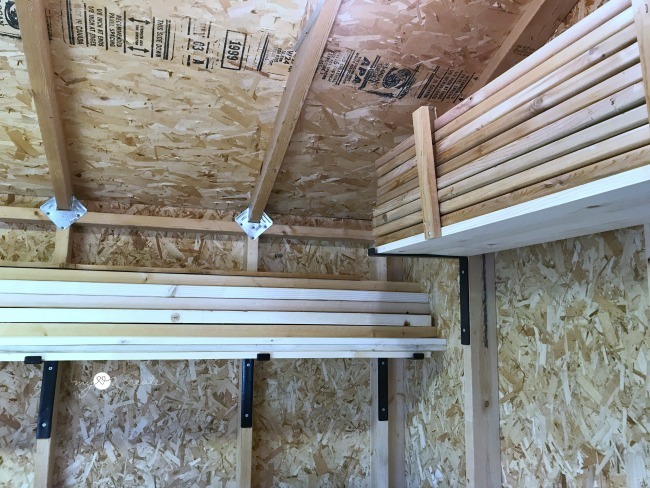 You can see I placed my boards flush to the studs, so it leaves a little gap in the front, but for storage shelves I am totally fine with it. If I was using these for decorative shelves I would have placed the boards to the front of the brackets. Look at all that off the floor storage space!! 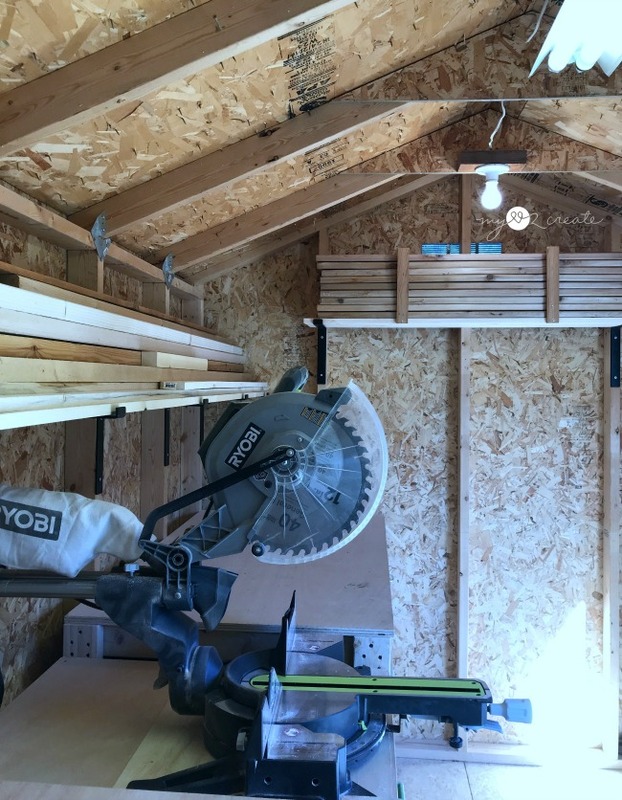 The cool part is that you don't have to just use it for lumber, you can use it for tools, supplies, anything! Step 4: Load up the shelves! Once I loaded my shelves I was sooooo excited! 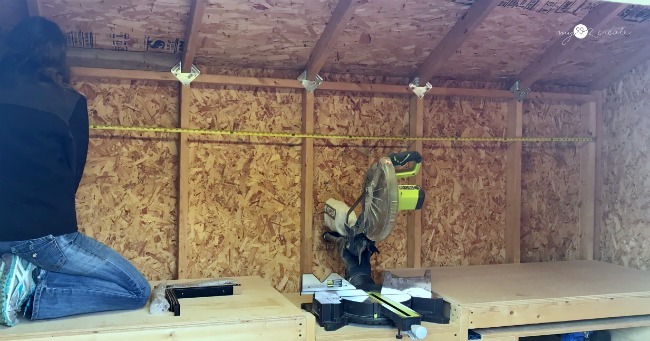 It will be great to have easy access to my wood and I can put longer scraps up there while I am cutting as well! My neighbor down the road had given me some more cedar boards so I put them on my side shelves. Since I had so many stacked up, I cut some scrap 1x2 boards and screwed them to the shelves so they could act as braces just in case the wood gets knocked...now it can't fall on me! It is so nice to have this wood off the floor and closer, I usually keep it on my back patio, which sometimes involves hiking through snow. Not fun! I am thinking that I could totally use these in the garage too. And of course they would be amazing as decorative shelves in any room in the house...hopefully my bathroom/laundry room soon! So what do you think? 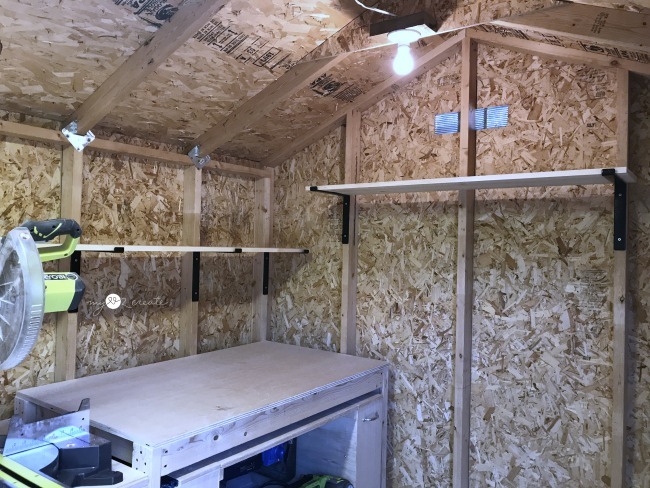 Could you use some extra off the floor storage in your shop or garage? This is a great option for quick and easy storage! 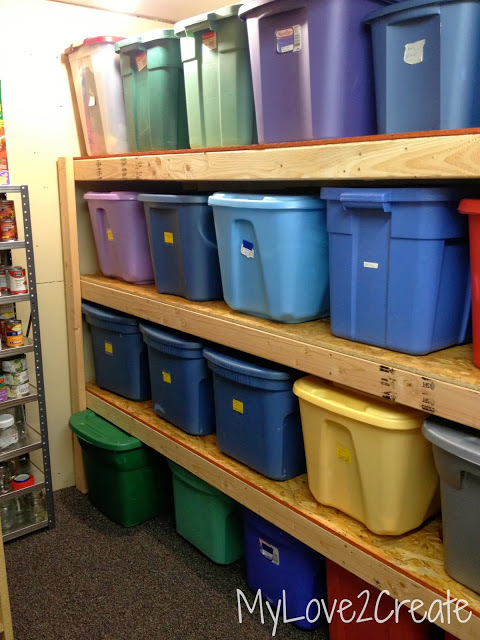 If you need a lot of storage room, check out my Storage Shelves I put in my basement! In love. or Click Here more Awesome storage and shelf ideas on my blog! *This is not a sponsored post but I did receive free product from Crates and Pallet. As always, all thoughts, opinions, and ideas are my own! 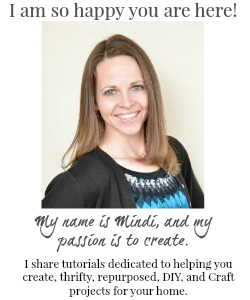 Nice write up Mindi, will be building a pair of these soon.